I recently read Chris Anderson’s book The Long Tail which provides a survey of the current “economics of abundance” and, among other things, explains why it’s not shameful to be an independent writer. It seems self-published writers are simply jumping on the bandwagon of an economic trend that has been a long time in the making. But first, a stroll down memory lane… I remember a friend of mine getting genuinely angry when I said that I prefer the old Battlestar Gallactica series to the new. “Sure, it seems cute and funny to you,” she said, “but you weren’t alive in the 70s and you don’t realize that we had to watch this crap because there was nothing else on!” Her words now come back to me as I realize that we are blessed with all this variety thanks to the internet. Instead of watching primetime TV, we can go online watch whatever suits our taste, no matter how weird our taste is. This is why the Long Tail is a wonderful thing, both for consumers and producers. As we can see from this graph, there are the “hits” (ie Hollywood blockbusters, Top 40 songs, Dan Brown books) and then there is something that looks like a Kangaroo tail extending for miles and miles. This includes all the independent writers, directors, unicycle makers, and anything else you can think of. The internet has made it possible for these producers to connect with customers, and now people can actually enjoy a variety of products instead of having to be satisfied with the latest “crap” that’s being marketed to them by the hit-makers. Sure, the tail is thin compared to the head. 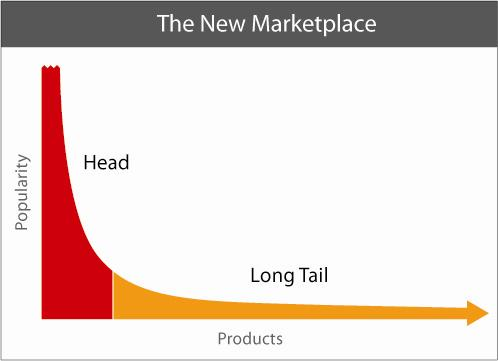 “Tail” products don’t have a huge marketing machine behind them, but they still make sales, and with enough of a fan base, they too can be propelled into the mainstream. For example, if like me, you’re interested in writing historical novels, you might think, “I will never be successful. It’s not like swashbuckling novels can be a big hit. Britney Spears is the making all the big hits these days… So I should probably write about Britney Spears.” But then you know that what you really want to write is historical adventures, and you spend all your time trying to think of a way to fit Britney Spears into thirteenth-century England, and then to prevent your brain from exploding, you give up and become an accountant. Luckily for us, we don’t have to think like that anymore. We can say, “I’m going to write an historical novel, and there are some people out there who will buy it and enjoy it.” You might not make as much money as Britney Spears, but you will write what you want, and you will be fulfilling a need because somewhere out there are readers looking for exactly the kind of book you’re writing. Of course, so many independent books sell something like one copy per month, so you may want to look into becoming an accountant after all. On the downside, this effect also puts more pressure on traditional book publishers, and makes them even more liable to look for the “big hit.” It’s quite possible that in the future only books by truly great authors like Justin Bieber (that was a joke, of course) will be released by the major publishing houses. Hopefully this will not happen! Click here to purchase Dryad on KOBO. Click here to purchase Dryad on Smashwords. Click here to purchase Dryad on Barnes & Noble. Click here to purchase Dryad on iTunes.